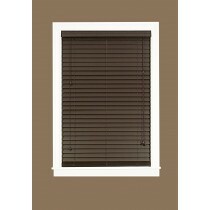 Faux Wood Blinds are an excellent alternative to more expensive hardwood blinds. Faux Wood Blinds are available in a variety of materials such as composite wood, vinyl, polyvinyl chloride (PVC), or a combination of materials. 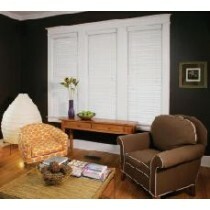 This allows Faux Wood Blinds to be sold in a wide variety of looks, styles, and price points. Faux Wood blinds can be of very high quality, and are much more cost effective that traditional wood blinds with the same patterns and styles. 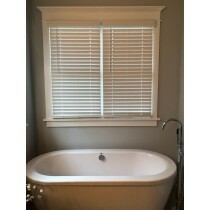 The most common reason a homeowner will choose a faux wood blind over solid wood is the price. 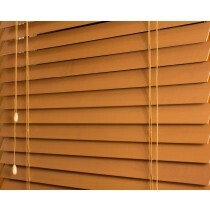 Solid wood blinds are not cheap, and you can attain a similar look and feel using faux wood. While faux wood does an excellent job of mimicking real wood, nothing compares to the beauty of real wood blinds. Beyond just the aesthetics of your room there are other factors you will want to consider. First real wood is significantly lighter and will often last longer than blinds made of faux wood. Real wood also endures exposure to sun and heat better than faux wood. This makes real wood less likely to fade or warp. However if you are installing blinds in bathrooms, kitchens, or other rooms with high humidity levels, real wood can warp from the moisture. Therefore when selecting blinds it is important to consider not just how well the material will match the aesthetics of your room, but the environmental conditions as well. Finally the place of manufacture can play a role in the quality of your blinds, and we always recommend blinds made in America. 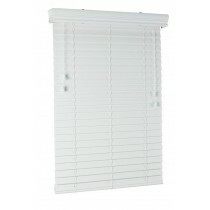 American made blinds are of a higher quality than blinds imported from overseas. This quality translates to greater duability which means your blinds last longer, and with fewer problems.